Painful insulin injections could become a thing of the past for the millions who suffer from diabetes, thanks to researchers who have created the first "smart insulin patch" that can detect increases in blood sugar levels and secrete doses of insulin into the bloodstream whenever needed. the joint UNC/NC State Biomedical Engineering Department. Diabetes affects more than 387 million people worldwide, and that number is expected to grow to 592 million by the year 2035. Patients with type 1 and advanced type 2 diabetes try to keep their blood sugar levels under control with regular finger pricks and repeated insulin shots, a process that is painful and imprecise. Injecting the wrong amount of medication can lead to significant complications like blindness and limb amputations, or even more disastrous consequences such as diabetic comas and death. Instead of inventing another completely manmade system, the researchers chose to emulate the body's natural insulin generators known as beta cells. These versatile cells act both as factories and warehouses, making and storing insulin in tiny sacs called vesicles. They also behave like alarm call centers, sensing increases in blood sugar levels and signaling the release of insulin into the bloodstream. The researchers used two materials that could easily be found in nature. The first material was hyaluronic acid or HA, a natural substance that is an ingredient of many cosmetics. The second was 2-nitroimidazole or NI, an organic compound commonly used in diagnostics. The researchers connected the two to create a new molecule, with one end that was water-loving or hydrophilic and one that was water-fearing or hydrophobic. A mixture of these molecules self-assembled into a vesicle, much like the coalescing of oil droplets in water, with the hydrophobic ends pointing inward and the hydrophilic ends pointing outward. Once the researchers designed these "intelligent insulin nanoparticles", they had to figure out a way to administer them to patients with diabetes. Rather than rely on the large needles or catheters that had beleaguered previous approaches, they decided to incorporate these balls of sugar-sensing, insulin-releasing material into an array of tiny needles. These "microneedles" were created using the same hyaluronic acid that was a chief ingredient of the nanoparticles, only in a more rigid form so the tiny needles were stiff enough to pierce the skin. They arranged more than one hundred of these microneedles on a thin silicon strip to create what looks like a tiny, painless version of a bed of nails. 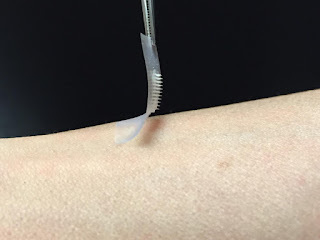 When this patch was placed onto the skin, the microneedles penetrated the surface, tapping into the blood flowing through the capillaries just below. Because mice are less sensitive to insulin than humans, the researchers think that the blood sugar-stabilizing effects of the patch could last even longer when given to actual patients. Their eventual goal is to develop a smart insulin patch that patients would only have to change every few days. Based on material originally posted by University of North Carolina Health Care.